Once every three years, the City of Hiroshima presents the Hiroshima Prize to an artist who has made a significant contribution to the peace of all humanity in the field of contemporary art. This honor is accompanied by a commemorative exhibition at the Hiroshima City Museum of Contemporary Art. In 2011, an exhibition titled Yoko Ono: The Road of Hope 2011 was held to commemorate the fact that Yoko Ono was chosen to receive the 8th Hiroshima Prize. Ono’s work My Mommy is Beautiful, which was included in that exhibition, is a participatory piece in which visitors are invited to convey their feelings to their mother by writing directly on or attaching a piece of paper to a wall. Along with the installation, Ono inscribed a message to her own mother when the work was first shown. 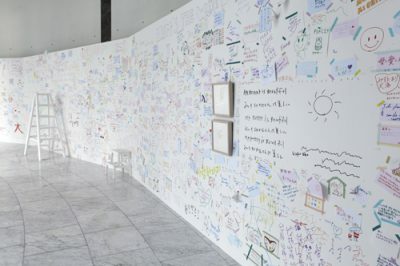 These countless messages to various individuals’ mothers were displayed on the large wall, gradually developing into an homage to the mothers of Hiroshima and mothers all over the world. After the exhibition came to a close, Ono donated the work to the museum and it is now part of our collection. With Ono’s permission, we are pleased to once again present her work My Mommy is Beautiful. Please feel free to write a message to your mother on a piece of paper and attach it to the wall.